The primary legislation related to organ donation and transplantation in India, Transplantation of Human Organs Act, was passed in 1994 and was aimed at regulation of removal, storage, and transplantation of human organs for therapeutic purposes and for prevention of commercial dealings in human organs. In India, matters related to health are governed by each state. The act was initiated at the request of Maharashtra, Himachal Pradesh, and Goa (who therefore adopted it by default) and was subsequently adopted by all states except Andhra Pradesh and Jammu and Kashmir. Despite a regulatory framework, cases of commercial dealings in human organs were reported in the media. An amendment to the act was proposed by the states of Goa, Himachal Pradesh, and West Bengal in 2009 to address inadequacies in the efficacy, relevance, and impact of the act. The amendment to the act was passed by the parliament in 2011, and the rules were notified in 2014. The same is adopted by the proposing states and union territories by default and may be adopted by other states by passing a resolution. There are some differences between act of 1995 and subsequent rules passed in 2014,,, [Table 1]. This article highlights the salient features for the beginners. It aims to give an introduction to the Transplantation of Human Organs and Tissues Act (THOTA), which is not usually a part of the syllabus, but a good understanding is required by all involved in transplantation. It is constituted under the chairpersonship of administrative expert not below the rank of the Secretary to the State Government for a period of 2 years to aid and advise the appropriate authority and the two medical experts who possess a postgraduate medical degree and at least 5 years' experience in the field of organ or tissue transplantation. All other than related transplantations or foreign transplantations are evaluated by the authorization committees. It regulates living-donor transplantation by reviewing each case to ensure that the living donor is not exploited for monetary considerations and to prevent commercial dealings in transplantation. It also inspects and grants registration to hospitals for transplantation, enforces required standards for hospitals, and conducts regular inspections of hospitals to examine the quality of transplantations. It may conduct investigations into complaints regarding breach of provisions of the act and has the powers of a civil court to summon any person, request documents, and issue search warrants. Two senior persons of high integrity, credibility, and social standing (preferably one female) who may be doctors, lawyers, chartered accountants, judges, police personnel, etc. The quorum of the Authorization Committee should be minimum four and the quorum is not complete without participation of the Chairman, the Secretary (Health) or nominee and Director of Health Services or nominee. Hospital authorization committee – It is proposed in hospitals which do >25 transplants per year. It means the head of the institution or hospital carrying out transplantation or committee constituted by the head of the institution or hospital for the purpose; the members should not a part of the transplant team. It gives permission for near-related transplants only. Any person aggrieved by an order of regulatory body may appeal to the central government or state government as the case may be within 30 days from receipt of the order. There are 21 forms described in the 2014 rules. These are given in [Table 2]. All the transplant physicians and surgeons and the hospitals performing transplants should be aware of these forms and should send the applications in proper format for avoiding delays [Table 2]. These may be living-related donors, spousal donors, or other than near-related donors. Near-related donors include parents, siblings, and children. In the recent 2014 rules, grandparents have also been included in the list of near-related donors. There should be documentary evidence of relationship, for example, relevant birth certificates, relationship certificate from Tehsildar or subdivisional magistrate or Metropolitan Magistrate or Sarpanch of the Panchayat, or similar other identity certificates such as Electors' Photo Identity Card or Aadhaar card and documentary evidence of identity and residence of the proposed donor, ration card, or voters' identity card or passport or driving license or permanent account number card or bank account and family photograph depicting the proposed donor and the proposed recipient along with another near relative. If the relationship is not conclusively established after evaluating the above evidence, human leukocyte antigen matching or DNA fingerprinting from a laboratory accredited with National Accreditation Board for Testing and Calibration Laboratories should be done. The forms required to be filled in live donation include Form 1 for donor consent, Form 4 for donor fitness, Form 11 which is joint application form, and committee permission which is given as per format given in Form 18. Spousal transplants are also considered as near-related transplants. Where the proposed transplant is between a married couple, documents such as marriage certificate and marriage photograph are kept for records along with the information on the number and age of children and a family photograph depicting the entire family and birth certificate of children containing the particulars of parents. For a spousal donor, the forms required thus include Form 2, Form 4 for donor fitness, and Form 11 which is joint application form filled by donor and recipient. The committee grants permission in the format given in Form 6. It is also included in the 2014 rules. Swap donation means, if in a family (family number 1), you have a donor and recipient who are near related but their blood group is incompatible, i.e., donor is A+ and recipient is B+, and in another family (family number 2), the donor is B+ while the recipient is A+, the donor of family number 1 can donate to recipient 2, and donor 2 can donate to recipient 1. This can help to increase the donor pool. Swap transplant should be carried out simultaneously, so there is no donor reneging. Donor reneging means that one of the donors backs out from donation. Furthermore, the donor and recipient pair in a family should be near related. All donors expect those defined under near-related donors come under this category. Permission in such cases is granted only by the authorization committee. This category is the most controversial as there is a possibility of monetary transaction in case of donation from a poor person to a rich recipient where the latter can coerce the poor donor to donate his/her organ against his will in order to get some money in exchange. The transplant act has made several provisions to avoid organ trade. The donor–recipient interview is recorded. When the proposed donor and the recipient are not near relatives, the Authorization Committee (I) evaluates that there is no commercial transaction between the recipient and the donor; (II) prepares an explanation of the link between them and the circumstances which led to the offer being made; (III) examines the reasons why the donor wishes to donate; (IV) examines the documentary evidence of the link, for example, proof that they have lived together, etc. ; (V) examines old photographs showing the donor and the recipient together; (VI) evaluates that there is no middleman or tout involved; (VII) evaluates financial status of the donor and the recipient by examining appropriate evidence of their vocation and income for the previous three financial years and any gross disparity between the status of the two is evaluated in the backdrop of the objective of preventing commercial dealing; (VIII) ensures that the donor is not a drug addict; and (IX) ensures that the near relative or if near relative is not available, any adult person related to donor by blood or marriage is interviewed regarding awareness about his or her intention to donate an organ or tissue, the authenticity of the link between the donor and the recipient, and the reasons for donation, and any strong views or disagreement or objection of such kin is also recorded. The forms required thus include Form 3 for donor consent, Form 4 for donor fitness, and Form 11 which is joint application form and committee permission. The committee grants permission in the format given in Form 19 for other than near-related donors. When the living donor is unrelated and if donor or recipient belongs to a state, other than the state where the transplantation is to be undertaken, verification of residential status by Tehsildar, or any other authorized officer for the purpose with a copy marked to the appropriate authority of the state of domicile of donor or recipient is required as per Form 20. All such cases are dealt by authorization committee. In case of foreign donors donating to their relatives in India, the transplantation is permitted only in near-related donors. Indian living donors wanting to donate to a foreigner other than near relative shall not be considered. In case of foreigners coming for transplantation in India, for example, donor and recipient being foreigners, the transplant is permitted in India with permission from a senior embassy official of the country of origin who certifies the relationship between the donor and the recipient, and in case, a country does not have an embassy in India, and the certificate of relationship is issued by the government of that country. For all living donations, the donor is subjected to all such medical tests to determine his or her biological capacity and compatibility to donate the organ. The physical and mental evaluation of the donor should be certified by the registered medical practitioner in Form 4. It is another source of organs. Deceased donation can be either after brain death (brain stem death) or after cardiac death. Brain death is defined as cessation of activities of brain stem and it is a clinical diagnosis. It is generally declared in patients on ventilator where Glasgow Coma Score (GCS) shows 3/15. The presence of brain stem reflexes is checked. The reflexes include the followings as shown in [Table 3] and each reflex tests one important part of the brain stem. Apnea test is done bedside where the principle increases the CO2 concentration in the blood to 60 mm which provides maximum stimulation to the respiratory center in the brain stem. If this does not induce any spontaneous respiration, the person is declared brain dead. The apnea test should be repeated twice at an interval of 6 h in an adult. In pediatric age group, the interval between two apnea tests is longer. At the beginning of the test, the patient is preoxygenated with 100% oxygen, and then, the ventilator is disconnected. The hemodynamics should be monitored during the apnea test, and if there is a fall in blood pressure, the apnea test is abandoned. The brain death certification is done by a panel of four doctors: (I) hospital administrator; (II) resident doctor of the hospital; (III) neurologist/neurosurgeon/physician, intensivist, and anesthetist; and (IV) treating doctor. In the recent 2014 rules apart from neurologist or neurosurgeons, anesthetists, critical care specialists, intensivists, physicians, or surgeons have been included to facilitate brain death declaration. People can pledge their organs during their lifetime if they want their organs to be used after death. For this, they need to fill the pledge form which is mentioned in Form 7. After certification of brain stem death of the person, it is now mandatory for the medical practitioner to ask the near relative or person in lawful possession of the body of a person admitted in Intensive Care Unit (ICU) that whether the donor had, in the presence of two or more witnesses (at least one of whom is a near relative of such person), authorized before his or her death as specified in Form 7, the removal of his or her organs or tissues after his or her death, for therapeutic purposes. If not, the relative should be made aware of the option of organ donation. Even if the donor has pledged his organs before death, the consent of near relative or person in lawful possession of the body is also required. The forms required for donation from brain dead donor include Form 8 and Form 9. The committee grants permission in the format given in Form 10. The cost for maintenance of the cadaver (brain stem dead declared person), retrieval of organs or tissues, their transportation, and preservation is not borne by the donor family but is borne by the recipient or institution or government or nongovernment organization or society as decided by the respective state government. Procedure for donation of organ or tissue in medicolegal cases – Medicolegal cases (MLC) are also acceptable for organ donation, but proper protocols have to be followed as per the THOTA. After the brain stem death declaration and consent to donate organs from a brain stem dead donor are obtained, the registered medical practitioner of the hospital requests to the Superintendent of Police or Deputy Inspector General of the area either directly or through the police post located in the hospital to facilitate timely retrieval of organs from the donor, and a copy of such a request is sent to the designated postmortem doctor of area simultaneously. It is ensured that, by retrieving organs, the determination of the cause of death is not jeopardized. The medical report is prepared at the time of retrieval by retrieving doctor and is taken on record in postmortem notes by the registered medical practitioner doing postmortem. The postmortem registered medical practitioner should be present at the time of organ or tissue retrieval even after office hours. In case, retrieval hospital is not doing postmortem, they arrange transportation of body along with medical records, after organ retrieval, to the designated postmortem center, and the postmortem center undertakes the postmortem of such cases on priority, even beyond office timing, so that the body is handed over to the relatives with least inconvenience. Workforce and facilities required for registration of a hospital as a transplant center and also infrastructure, equipment requirements and guidelines, and standard operating procedures for tissue banks have been outlined in the act. Qualifications of transplant surgeons and cornea and tissue retrieval technicians have been defined. For a hospital wanting to register for transplantation, an application for registration should be made to the Appropriate Authority as specified in Form 12 or Form 13 or Form 14 or Form 15, depending on organ, tissue, or eye bank, and the application is accompanied by fee as specified, payable to the Appropriate Authority by means of a bank draft. The details in the form include the geographic location of the hospital, connectivity, staff, equipment, laboratories, blood bank details, and biomedical waste management details. After inspection, the permission is given in the format of Form 17. Permission is valid for 5 years. Some hospitals may wish to contribute to organ donation but do not have facilities for organ transplantation. Such hospitals are known as nontransplantation organ retrieval centers. Any hospital having ICU facilities along with workforce, infrastructure, and equipment as required to diagnose and maintain the brain stem dead person and to retrieve and transport organs and tissues including the facility for their temporary storage can register as a retrieval center. Nongovernmental organizations, registered societies, and trusts working in the field of organ or tissue removal, storage, or transplantation also require registration. They are the key components of any organ transplantation program. 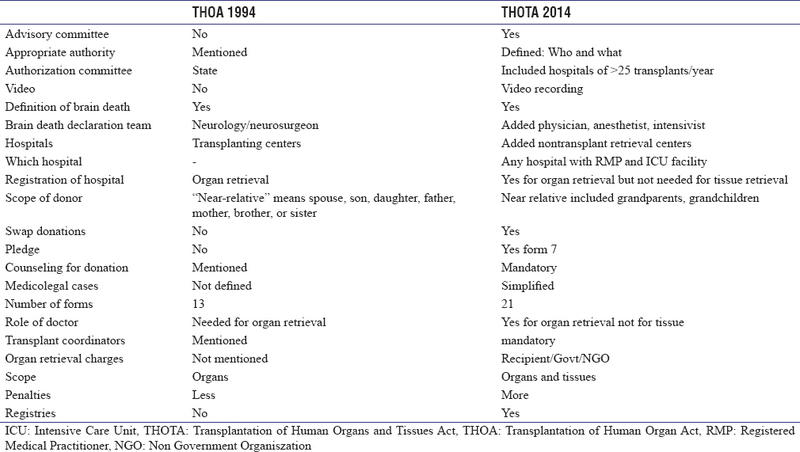 As per the THOTA 2014 rules, they have been made mandatory in all organ retrieval and transplanting centers. 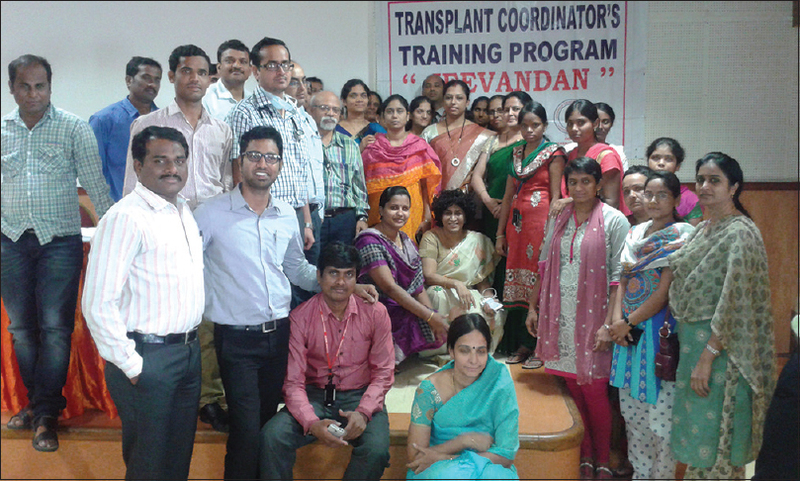 Transplant coordinators are being trained by NDO and MOHAN foundation, and in some states, for example, in Telangana as a part of Jeevandan Programme, Osmania General hospital has been given the task of training the coordinators and certificates are being provided [Figure 1]. In a deceased donor program, the transplant coordinators coordinate brain death declaration, organ retrieval, and donation, help in form filling, and even help with the last rites of the donor. As the organ transplant program involves multiple specialists, physicians, laboratory personnel, and police, the role of transplant coordinator is very important. Even in the living donor program, they facilitate the process. Penalties for the removal of organ without authority, making or receiving payment for supplying human organs, or contravening any other provisions of the act have been made very stringent in order to serve as a deterrent for such activities. These may be in the form of financial penalties, imprisonment, or suspension of license. The act provides for establishment and maintenance of registries. The data of the patients as well as the donors are uploaded on the website. India now has transplantation and tissue organizations at a three-tier level. It is at the center. Currently, it is located at Safdarjung Hospital at New Delhi and is the main central body for overall supervision. The website for NOTTO is www.notto.nic.in. It is at regional level and coordinates transplantation- related activities in the region. State Organ and Tissue Transplant Organization. It is at the state level and is responsible for coordinating activities at the level of state. Various states have their own organizations and websites. Some of the examples are Jeevandan in Telangana, Transtan in Tamil Nadu, Zonal Transplant Coordination Centre in Maharashtra, Kerala Network for Organ Sharing in Kerala, Jeevasarthakathe in Karnataka, and Rajasthan Network for Organ Sharing in Rajasthan. These have their own websites and maintain data about the transplants and donations done in their respective states and are an important source of transplant and organ donation data. State units would be linked to hospitals, organ or tissue matching laboratories, and tissue banks within their area and also to regional and national networking organizations. We lack nationwide registries. The development of national and regional networking is highlighted in the act. It would be a step forward if we have our state and regional registries and link these with the national registry so that we can have our own Indian data on patients waiting for transplant, patients transplanted, and donor details (live or deceased), including all demographic, clinical laboratory, and follow data. The registries would be online. This would, on the one hand, serve as a source of data for matching of organ donors and recipients and providing the option of a best possible match using big data analysis. In addition, it will help assess outcomes and pave the way for improving practices and developing Indian guidelines. Among all recipients listed for transplants from deceased donors, priority will be given in following order: (i) those who do not have any suitable living donor among near relatives; (ii) those who have a suitable living donor available among near relatives, but the donor has refused in writing to donate; and (iii) those who have a suitable living donor available and who has also not refused to donate in writing. The sequence of allocation of organs shall be in the following order: (i) State list, (ii) Regional list, (iii) National list, (iv) Person of Indian origin, (v) Foreigner. In future, all the state and regional centers should be linked with the national organization so that all the data can be collated and good Indian data can be obtained. However, as each region may have its own unique needs, the local centers should also be given some autonomy to fine tune the policies according to the local needs. The transplantation act has evolved over last few decades to its present form. The latest rules are available on the website of Indian Society of Organ Transplantation as well. As transplant physicians and surgeons, we should make ourselves aware of the existent rules. Even the students in transplant program should be made aware of these guidelines. This will go a long way in avoiding legal hassles in day-to-day transplant practice. Government of India. Transplantation of Human Organs Act, 1994. Central Act 42; 1994. Available from: http://www.medindianet/tho/thobill1asp. [Last accessed on 2018 May 30]. Gazette – Transplantation of Human Organs Rules. (GSR NO 51(E), dr 4-2-1995) [As amended vide GSR 571(E), dt31-7-2008]; 1995. Available from: http://wwwmedindianet/indian_health_act/The-Transplantation-of-Human-Organ-Rules-1995-Definitions.htm. [Last accessed on 2018 May 30]. Transplantation of Human Organs (Amendment) Act, 2011. 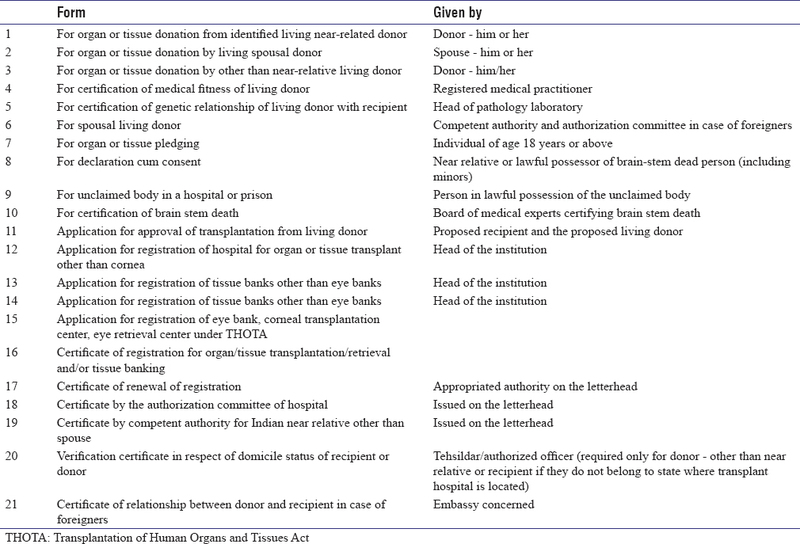 Available from: https://www.india.gov.in/transplantation-human-organs-amendment- act-2011. [Last accessed on 2018 May 30]. The Gazette of India. Extraordinary Transplantation of Human Organs and Tissues Rules (thot) Ministry of Health and Family Welfare Notification. Part 2. Sec 3. New Delhi: The Gazette of India; 2014.